After an initial postponement ChubuSat-2, ChubuSat-3 and Horyu-4 were launched into a 575 km, 31 degree inclination orbit at 08:45 UT on Wednesday, February 17, 2016. 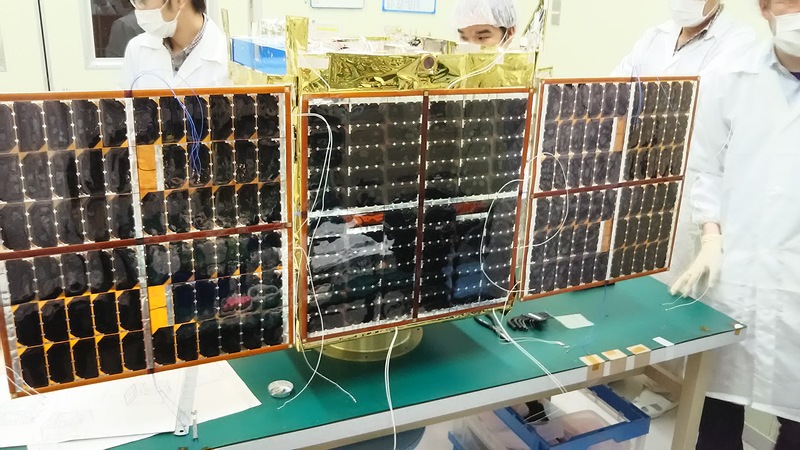 Nagoya University(NU) and Mitsubishi Heavy Industries(MHI) developed 50kg microsatellite ChubuSat-2(NU) and ChubuSat-3(MHI). These satellites have amateur VHF receiver and amateur UHF transmitter, and will be launched on Feb. 12 2016 (Note: Now Postponed) from Tanegashima, Japan. Komaki Amateur SATCOM Club operates these satellites from Komaki, Japan. In following web site, we show the information(frequency, format, TLE, etc.) about ChubuSat-2 and ChubuSat-3. If we have your report, we will show your report in this page. Both satellite will provide the message exchange service. After the on-orbit checkout of the satellite(maybe one month after launch), you can use this service, sending your message with VHF uplink, then your message is written to the on-board memory. By sending inquiry message, anyone can read your message with UHF downlink. The uplink/downlink format will be uploaded in above web site. We hope you get interested in our satellites, receive beacon messages, and enjoy the message exchange service.